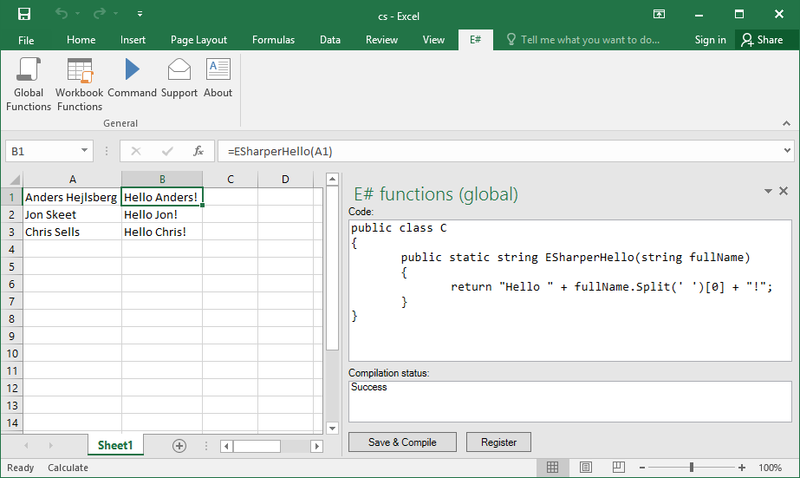 As you change C# code and click Register in the ESharper functions custom task pane, the updated functions immediately become available in the current running Excel instance and the active sheet is automatically recalculated. You can write as many UDF functions and formulas for Excel as you want, just declare them public and static in the code. 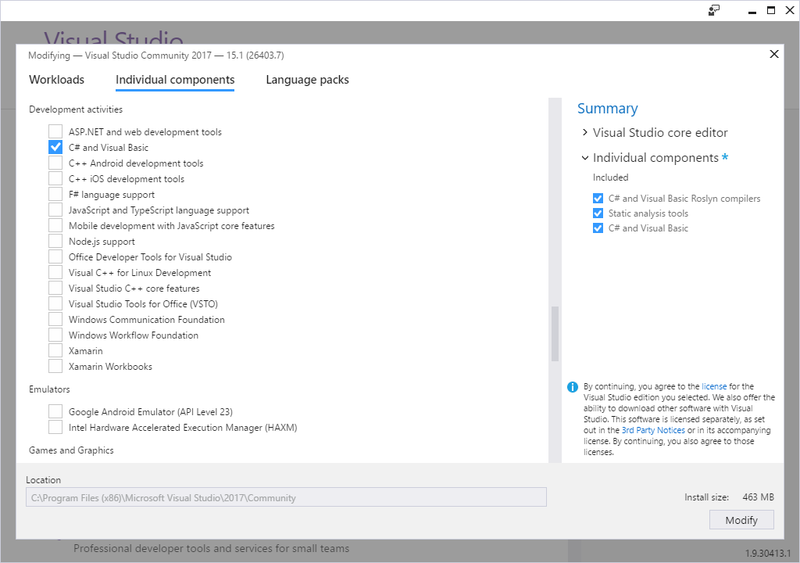 You can use C# 4.0 language features when .NET 4 is installed and C# 5.0 features when .NET 4.5 is installed. 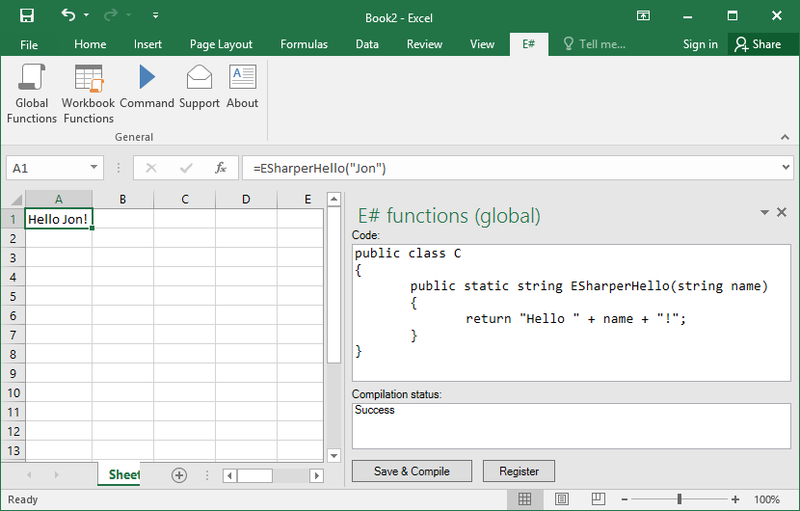 Global functions created with ESharper can be used in any workbook on your computer. They are stored outside Excel in the %AppData%\Vlasov Studio\ESharper\1.0\modules.esharper file and are automatically loaded on Excel startup. Workbook functions created with ESharper are stored in the workbook .xlsx file and will be available on another computer where you copy the .xlsx file. Workbook functions are not automatically registered when you open a workbook (to prevent automatic unknown code execution from an external .xlsx file). When you click Save & Compile for workbook functions, they are saved in the loaded workbook instance like ordinary workbook changes. To persist changes to the file, you need to save the workbook as usual. 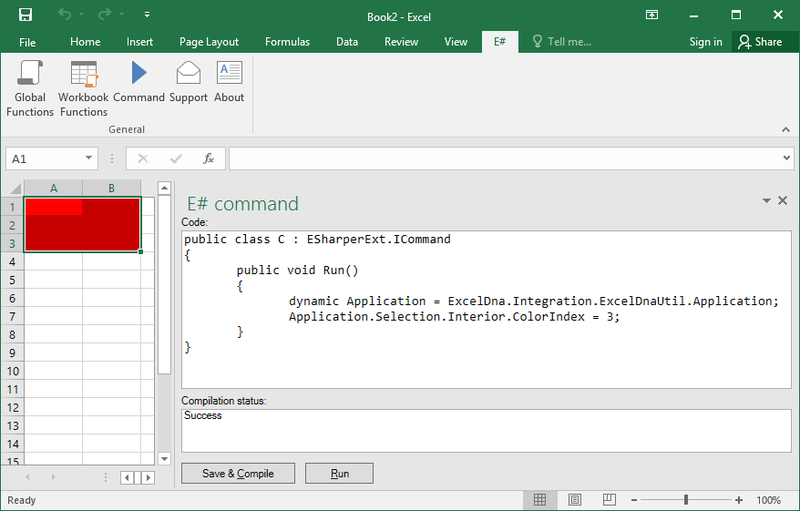 A command created with ESharper lets you automate Excel operations. It is stored outside Excel in the %AppData%\Vlasov Studio\ESharper\1.0\commands.esharper file. 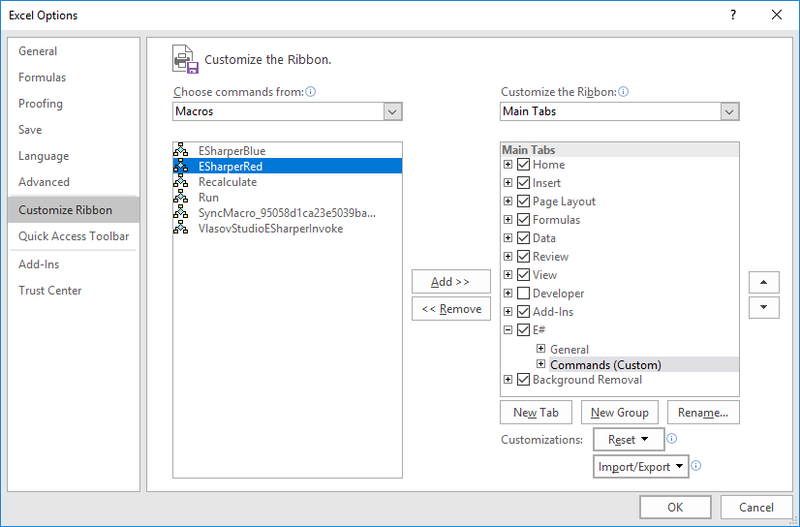 You can register multiple commands and assign them to buttons on the Ribbon. 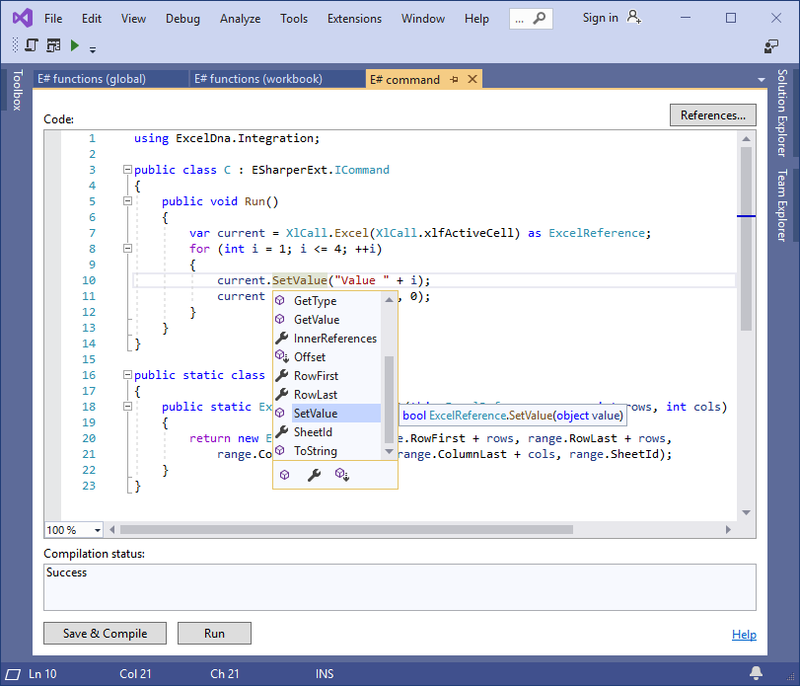 From the ESharper toolbar in Visual Studio, you can open the same global functions, workbook functions and command editors. 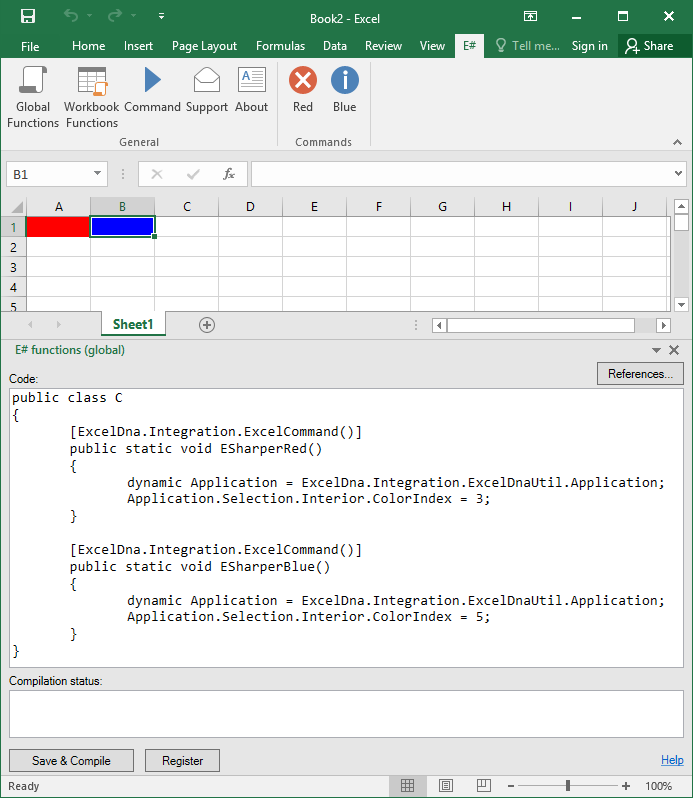 Code changes are applied to the current running Excel instance. If there is a compilation error, double-clicking on it in the Compilation status box will navigate directly to the relevant code (line and column of the error) in the code editor. ESharper Excel integration is based on Excel-DNA. From your code you can easily access Excel object model API using the ExcelDna.Integration.ExcelDnaUtil.Application as a dynamic object or a Microsoft.Office.Interop.Excel.Application object (see documentation) and Excel C API using ExcelDna.Integration.ExcelReference and ExcelDna.Integration.XlCall classes (see documentation). Click Save & Compile to verify that sample code compiles successfully. Click Register to make the ESharperHello formula available as Excel UDF. Call ESharperHello from a cell with a string argument to see it in action. See more function examples and sample code. Click Save & Compile to verify that sample code compiles successfully. Select several cells and click Run to change their background color to red. See more command examples and sample code. Business licenses are paid by the number of Windows workstations ("Seats") where ESharper is installed. Any employee of your company can use ESharper on these workstations. The number of seats is the number of installations allowed. You will receive your registration code via e-mail after your order completes. We offer an unconditional 30 day money back guarantee. If for some reason you are not satisfied with ESharper, you can return it for a full refund. The personal license allows you to use ESharper on any number of computers or electronic devices, but you may not permit other individuals to use your license. The personal license must be purchased with personal funds and cannot be reimbursed by a company or organization. Purchase of the personal license includes 1 year of software updates and technical support.